More than a year ago, I wrote extensively about artificial sweeteners (are they bad for you?) and High-Fructose Corn Syrup, its origins, uses and its role in the American food supply. Both posts were among the most-discussed entries on SkinnyChef.com, and I have continued to keep an eye on food additives and artificial sweeteners. 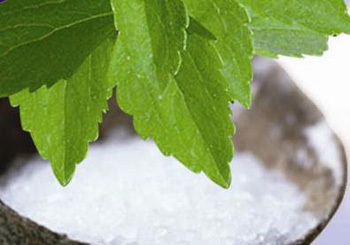 In the meantime, there has been a new addition to the artificial sweetener arsenal – stevia. Commonly also referred to as Rebiana, Truvia or PureVia – stevia-extracts were recognized in December 2008 by the FDA as “generally safe”, opening the door for soft-drink companies to roll out new “zero-calorie” drinks and waters. It’s been predicted that stevia will revitalize the soft drinks industry, but stevia’s bitter aftertaste has proved a challenge. Cargill says it’s developed ways to make various stevia-sweetened products taste natural, including cereal, yogurt, ice cream and beverages. I love your blog..It is very informative. I have been using sun crystals, wondered your take on them? it is a blend of stevia though. I read somewhere that stevia is natural..but not after it is chemically altered for our use. Hm. I need to check more on that. In spite of all the artificial sweeteners, new & old, that are available today, I’m sticking with saccharin! It’s the only one, to me, that tastes natural and doesn’t leave an aftertaste, nor does it leave any side effects. Thanks for your comment Deborah. It might not have an aftertaste, but saccharin has be proven to cause cancer in rat trials so I don’t reccomend it. If you can’t do without I would try and limit it as much as possible. I see a number of processed food with the high frutose corn syrup in them. I’ve wrote to companys when I see it in the nutrition information on their packaging to let them know that it doesn’t need to be there. The most recent one was frozen mixed veggies with a garlic seasoning (wasn’t a white sauce) so I thought it would be OK, read the package and there it was! the high frutose corn syrup! in vegetables! Do you think the high frutose corn syrup contributes to the rising obesity rate? It seems to me that a lot of packaged food products have gotten sweeter over the years and they definitely use HFCS as a cheap way to add sweetness. You can read more about the link between high fructose corn syrup and obesity rates on my blog post. Skinny Chef, you are so right! I read your blog post and it is so true! I was one of the obese people a year ago. Lost 45 lbs. by eating right. Less eating of the processed foods, ate whole grains and lean meat, and lentils. You see what prompted me to change my eating ways, I was told by the doctor that she wanted me on statin drugs. I told her I would change my way of eating instead. I’m so glad I did! Feel so much better. I really like your ideas and recipes. Thank you!